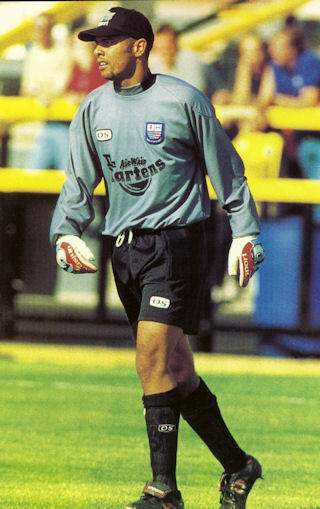 Goalkeeper Mark joined the club from Crewe Alexandra prior to the start of the 1998/1999 season. He had started his career as a trainee with Leicester City, before being released and joining Blackpool in 1989. After a brief spell with Worcester City, he joined Walsall in May 1991, and went on to make 92 appearances for the Saddlers. He moved to Crewe in December 1993 for a £35,000 fee, becoming their first choice keeper and playing 103 times. During five years at Crewe, he had loan spells with Liverpool, Birmingham City, Hereford United, Chesterfield and Luton Town before being released. He joined Diamonds in August 1998, and made an impressive start to his Diamonds career, helping the team to seven straight wins at the start of the season, before an injury at Doncaster Rovers kept him out of the team. On his recovery he struggled to get back in to the team, picking up a further injury that kept him out of the team in the latter stage of the FA Cup run that culminated in two games against Leeds United. He was then unable to regain his place back in the side, although few Diamonds fans had seen him have a bad game for the club. He was released after Diamonds had signed Billy Turley, and joined Chesterfield on 7 August 1999, where he made 35 appearances. In the summer of 2000, he joined Hednesford Town, making over 100 appearances in two years, prior to spells with Solihull Borough, Hereford United, Halesowen Town, Solihull Borough (again), Tamworth, Halesowen Town (again). In 2007, he joined Southern League Division One Midlands side Rushall Olympic where he became player coach. He was still with the club (now in the Northern Premier League) during the 2009/2010 season, but has since retired from playing.